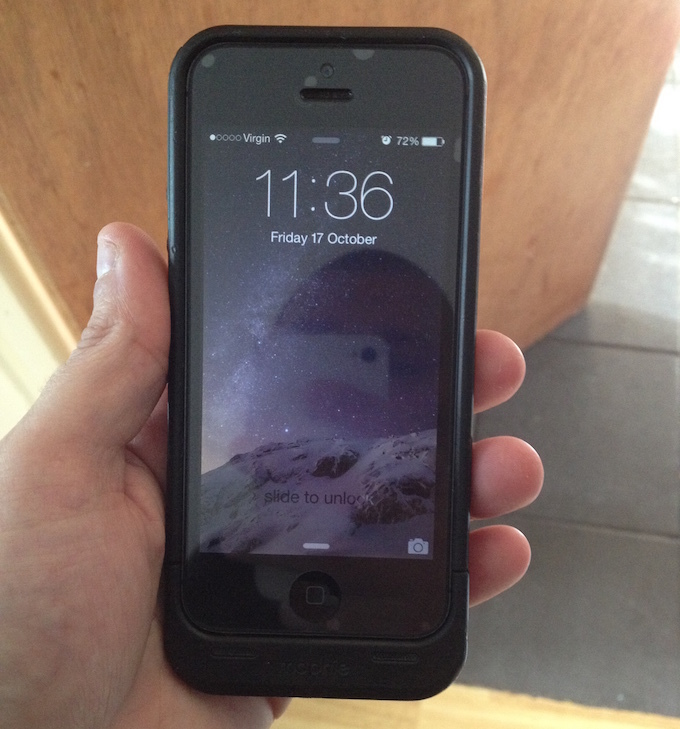 With a recent upgrade to an iPhone 5, I take a look at the Mophie Juice Pack Air. It’s no secret that I am a big fan of Mophie products. I have written numerous reviews for other models over the past few years, and this time I take a look at the Juice Pack Air for the iPhone 5 and iPhone 5s. Mophies are a tough case with a built-in battery so you can charge your phone on the move. This gives you longer away from a charging point and ensures you don’t get caught short when you need your phone the most. This case has a removable bottom section. You slide the phone into the main part of the case, and then the bottom section then clicks on. Just line up the Lightning connector and push it together. I have had ones like this before, and the two sections didn’t hold together well, but this one feels very tight. I have used both the Juice Pack Air and the Juice Pack Plus on an iPhone 4 and 4s, and while the Air is slightly thinner than a Plus, it still adds considerable bulk, which sits on the wrong side of uncomfortable. The Juice Pack Air for the iPhone 3G and 3GS also makes your phone very chunky. With the Juice Pack for the iPhone 5/5s Mophie have really looked at making them a lot thinner. Of course it still adds some bulk to the phone, but nowhere near as much as previous models. It feels easy in the hand and doesn’t add too much weight either. Previous Juice Pack Air models have had cutouts for the volume buttons, power button, and silence switch, making them a little hard to access – and some even have the entire top section cut out. However, all buttons – including silence switch – are now completely enclosed in this case – similar to the Juice Pack Plus for iPhone 4/4s, although even that had a cutout for the silence switch. The bottom of the Mophie has the usual passthrough for the mic and bottom speaker. The very bottom has a Micro-USB port for charging. This is a lot more sturdy than before. I have had problems with ports becoming lose or feeling too recessed on other models to ensure a secure connection, but this Air overcomes that. When Apple introduced the iPhone 5, it moved the headphone socket to the bottom. The extra length to this Mophie means plugging the headphones in can be quite tricky. I feed them through the bottom before clipping it to the phone. This can be a bit annoying – and if your headphones have a wide jack or L-shaped jack you might not be able use them. However, the bonus of this is that our headphone jack is protected from damage. I have been told that Mophie did offer an extension plug with these Juice Packs. The back of the case has the indicator lights, the button to check the charge, as well as on/off switch. The feel of the case gives it an excellent grip in the hand. The back is rubbery, as is the front rim. The side has a shiny plastic band housing the buttons. My black iPhone 5 looks fantastic in this Mophie. The all black look of both the phone and case blend together amazingly. A common issue with them – which mine has too – is they can develop a crack through the word ‘mophie’ on the front. This is purely in the top layer of the rubber part of the casing and not all the way through. Mophie really have stepped up everything on this Juice Pack. The battery is stated as offering up to 100% charge – up from previous Air models only pushing 70-80%. Charging the Mophie via Micro USB is very fast, and charging the phone via the Mophie when out and about is amazingly quick, a welcome change. I have always liked the idea of a Mophie, but the bulk, recessed buttons, and slow charging has bugged me. However, this Juice Pack Air has overcome all of these. Mophie has done a brilliant job in creating the Juice Pack Air for the iPhone 5 and 5s.